Stage 1 has continued to add contributions to the Jack and Jill page of our Nursery rhyme wiki! Four Stage 1 classes have now completed the lesson in which they suggested rhyming pairs for flashcards, made changes to the colour coded template (an online matrix I created by saving a Word document as HTML) on our wiki page to create their own nursery rhyme parody. It has been extremely effective to demonstrate how editing the screen on one computer and uploading the change is shown on all other monitors after refreshing the page (ie. pressing the “Enter” key). My three Flickr slideshows have proven to be useful, and I’ve been using these blog posts as bookmarks. I must set up a del.icio.us account some day! But I learned something very exciting yesterday. When the mouse is dragged across the middle of the frame, a large “i” icon appears. I assumed this meant “information” but I never thought to test it. Children don’t seem to have that lack of impulse to click a button; thus I discovered that my photo titles and description, in white text, superimpose the photos at the click of a mouse! Simple, but effective. Technology makes adults feel dumb sometimes! As I explained in my post about the fables wiki post, Term Four for our Early Stage One and Stage One students concentrates on fables. Now that we’ve started a new year, the school-based (three year, cyclic) literacy program devotes Term One to an exploration of nursery rhymes, Term Two to fairy stories, Term Three to Dreaming stories – and back to fables again in Term Four. On Fridays, I take eight Early Stage One and Stage One intensive language class students for an additional lesson, to help prepare them for their immersion into English lessons the next week. These students perform best in English when they have had lots of exposure to the field knowledge of the topic being studied. For the nursery rhymes unit, I like to emphasise the repetitiveness of rhyming words, the relative ease of memorising nursery rhymes, the historical context (as often reflected by the illustrations in children’s picture book collections of nursery rhymes), and really explore the often archaic vocabulary. Last year, these language students were integrated into several different English classes, and it was important that they entered Monday’s lessons full of confidence about the topic of each nursery rhyme (a different one each fortnight). This year, they come to the library on a Thursday (for their team-taught lesson) accompanied by junior students from our hearing support class. It will be interesting to see how these students work as a cohesive group in the upcoming week. We also discussed why they were called “nursery” rhymes, and then the meaning of the word “rhyme” in its context. Who are nursery rhymes told to? What’s a nursery? What’s a ryhme? Why weren’t they written down at first? Who do we tell nursery ryhmes to? I was thrilled that the Stage One students were remembering details from a similar set of lessons this time last year! Then I asked some questions: will we see the city or the country (harking back to last year’s The town mouse and the country mouse fable); will there be a rabbit in the picture (there was! ); will we see a mother/cow/shark/bottle of vinegar (what’s vinegar? ), etc. ; a cat? ; a crown? (What will the crown look like…? ); and so on. There is always a major emphasise on opportunities for the students to use repetitive oral language, in ways I had modelled, as they answered these questions. Next, we did a dramatisation of the nursery rhyme: miming the exhausting climbing of the steep hill; fetching the water; “Jack” rolling down the hill (the illustration had the bucket upturning onto Jack’s head, to great hilarity; “Jack” hurting the crown of his head; “Jill” tumbling after him; “trotting” home for medical attention; “Jack” crying out as vinegar was splashed on his head, etc. I also had a chance to tell an anecdote about my paternal grandfather, who always used to maintain that the best cure for injuries like Jack’s was a Depression-era poultice of Friar’s Balsam and brown paper! Sometimes I look at these five- and six-year old students and worry that I’m aiming too high, but they thrive on it! Their eyes grow wider and wider as we act out the words, not overlooking any of the quirky, now-anachronistic, terms. Their reactions as “Jack” suffered loudly his indignities with the vinegar soon had them telling their own anecdotes of various medical treatments for their cuts and scratches over the years. The dramatisation of the (rather abstract, to them) concepts in Jack and Jill have definitely became more real, and I know that they will surprise their class teacher on Monday with their newly-acquired field knowledge, and renewed confidence, in saying – and performing – the rhyme. Update (25 Feb): Success! Now check out Stage 1’s Nursery rhyme wiki page! First Stage 1 class for the week suggested rhyming pairs for flashcards, which were typed onto an online matrix on our wiki page to create their own nursery rhyme parodies. A friend just found this wonderful contemporary postcard last week, promoting the City of Sydney Library Network, an area which includes the public libraries at Customs House (Circular Quay), Glebe, Haymarket, Kings Cross, Newtown, Surry Hills, Ultimo and Waterloo. 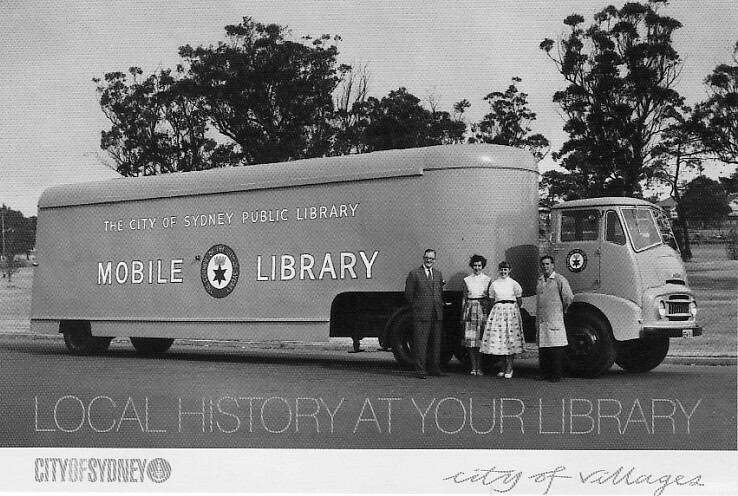 The postcard depicts the iconic 1950s Mobile Library, more commonly known as “the Bookmobile”. (There are no copyright details on the image, although it’s #SRC124, City of Sydney Archives). We had a Bookmobile in the Rockdale Municipal Council area, when I was in primary school in the 1960s. I recall distinctly our beloved teacher-librarian, Mrs Janette McKenny, telling us that there was such a thing – and, for months, I envisaged a colourful, open-to-the-elements Mardi Gras-like float, festooned with feathers, streamers, book posters, balloons and glitter. And loud, zany people selecting books. But this card made my friend smile with nostalgia. Ditto for me. Sometimes I network with other teachers and students without realising it, and it’s fantastic when it pays off. One of the advantages of collaboratively programming and planning lessons with each Stage group at school is that I can adapt each library activity to suit the various classes, taking into account the need to share available resources, and how best to complement the learning styles of the students and the teaching styles of their teachers. Last week, no matter whether intending to use the Chinese New Year Parade photos (taken for Early Stage 1 and Stage 1) or the Bridges photos (taken for Stage 2), I recycled the same jokes with each class (ie. “Unfortunately, I didn’t have time on Sunday to get to Antarctica to take some photos for Stage 3…”). I’m so glad I did, because one teacher announced that her brother had just returned from a vacation to Antarctica – and had CDs filled with photographs of… icebergs, Antarctic cabins, icebergs, penguins, more icebergs, humpback whales, and did I mention – icebergs! What a lucky break! And so, I was able to add a third slide show to my Flickr account, called Antarctica which the Stage 3 students will be able to use this week without worrying about the copyright of other Antarctica photos they may have found on the Internet! As I said, it pays to network. Or rather, it often pays to be loquacious, because that can lead to very effective networking. Next week, the NSW DET’s “Wilfrid Gordon McDonald Partridge” Book Rap goes live! Ian McLean and Jenny Scheffers, teacher librarians, will be coordinating this book rap. The Rap is live for viewing and subscribing (at no cost) the week of 18 February 2008. The Rap itself starts 25 February 2008. We hope that primary school teacher librarians and teachers will enjoy taking part in this exciting learning experience. This year, instead of an email listserv, we are using blogging tools and wikis to share the responses between participants in the rap. The blog format will have many advantages over a listserv, so please think of this as a learning adventure. 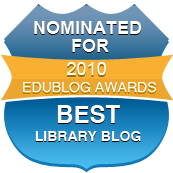 When teachers and teacher librarians first log in to the “Edublogs” site, they should be aware that the user name they choose for themselves will appear each time they post a blog message. For example, my “Edublogs” user name is “ianmclean”, but I could have chosen “mrmclean” or “class2z” or “penrithbloggers” instead. “Edublogs” suggests using a school-related email address if you’ll be posting blog entries from school, because you’ll need to acknowledge receipt of your welcome email message before your first post. If that message goes to a “hotmail” address, for example, that mail service may well be blocked by a firewall, or “Edublogs” might assume you’re not really connected to a school. “Edublogs” is a free blogging service from “WordPress” for legitimate educational purposes. The rap blog also has a Teachers’ area, to support the learning of the adult learners as we all gain more confidence with Web 2.0 facilities. The updated rap FAQs and “beginner’s guide” is at http://www.schools.nsw.edu.au/raps/beginnersguidetoraps.htm and should prove useful. During the first weeks of the Rap, participating classes post a short group introduction to the Rap Blog (under the tab called “Introductions”). In their post, they can describe the class group participating in the Rap and give brief, interesting details about the school. For example, you may wish to tell us about the size and location of your school, the uniform and emblem, or any special facilities. Please make sure that students’ individual surnames never appear on blog entries; it’s best to keep to a class identity. As groups of students are reading other schools’ Introductions during the next few days, your class may wish to plot the locations of other book rappers on a Rap Map, templates of which are available on the book rap site. Schools might also use websites such as “Google maps” or “Whereis.com”. Teachers are encouraged to visit the Teachers’ section regularly. We look forward to rapping with you all. “Wilfrid Gordon McDonald Partridge” Book Rap Coordinators.